Welcome to Rock A Bye Baby Gift Boxes owned and opperated by The Kiddie Company (UK) Ltd. We supply a wide selection of hand picked and packed beautiful newborn baby gifts for new mothers / parents and babies alike. All of our gifts are personally hand picked and packed by our experienced staff to ensure each of our customers receive products of the highest quality. We offer a beautiful selection of individual gifts, in addition to beautifully presented baby gift baskets, hampers and boxes which are hand picked by our team. We also supply baby clothes bouquets these not only look great and make fantastic gifts for presentations, but provide new parents with some essential items following their new arrival. The greatest gift we can offer to any new parent is our time. Sadly, that is not always possible - so why not offer the next best thing? A beautiful baby gift from our luxury range will be much appreciated and long remembered. We offer newborn baby gifts to suit all budgets, from beautiful individual keepsakes to carefully selected baskets and hampers. 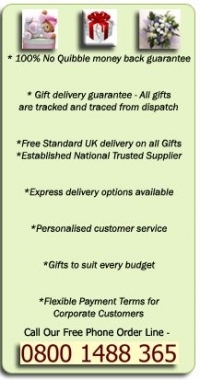 Our entire range of infant gifts come from UK based suppliers. They are packaged in white boxes and the contents are gently wrapped in luxury coloured ribbons providing a high quality appeal. Many of our baby gift boxes can also be adapted to suit newborn twins. The arrival of a newborn is always a joyous event. Normally this wonderful occasion is celebrated via baby showers and the offering of lavish gifts. The good thing with choosing a gift for a newborn baby or their parents is that there is no shortage of options. The sheer volume of choice ensures that even those with no experience with children will be able to find a suitable present. The difficulty is making your particular present stand out from the crowd. After all, we all want our presents to be appreciated and remembered; here we will be giving a few tips on how to pick a memorable baby gift. Baby showers are becoming increasingly popular and our carefully selected range of original gift ideas makes finding the perfect present for any expectant mother simple. We have presents available to suit all budgets, with each baby shower gift carefully selected, wrapped and delivered free within the UK. These wicker baskets are not just one present, but a whole bunch of useful and beautiful presents. Fill your baskets with a variety of little gifts; from clothes, bibs, bottles and dummies to cuddly toys, rattles and lullaby CDs. All presented in a beautiful basket, complete with ribbons and bows, your present will be aesthetically pleasing as well as highly useful. To complete the gift, why not add a few goodies for mummy? A box of chocolates or luxurious bathing oils will complete the package and make sure your baby's basket will be long remembered! Our selection of baby gift boxes, similar to our baskets, allow you to give not just one but a selection of individual items. Each gift box is made up of individual presents that have been carefully selected to complement one another and then beautifully packaged in a stylish gift box. Our hampers make a delightful gift to present to any new or expecting parent. The items included inside have been carefully chosen and are presented in a beautifully packaged, high quality wicker gift hamper for an added touch of luxury. A recent addition to our range, clothes bouquets make a beautiful alternative to flowers and last so much longer.